Another sunny Darwin day, no clouds, but the humidity is way up there. We got to parliament house just after 3pm, covered in a thin film of sweat. A scattering of people sat around on the lush green grass house, bathing in the shade provided by the Ceauşescu-like structure that is Parliament House (known by locals as The Wedding Cake). Trance techno drifted out of a small sound system and a dog wandered around welcoming newcomers. 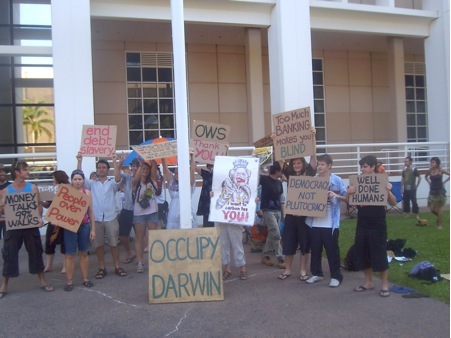 This being Darwin, the gathering was populated by the usual people you see at most protests. So it wasn’t a racial or cultural representation of Darwin, but there were a few new faces, some who looked younger than everyone else, which was heartening. Someone had thoughtfully provided a bunch of cardboard and paint to make up placards, with a number displayed on the wall of parliament house. I soon got busy making a placard with my four-year-old daughter, but the I WANT A FUTURE I had written was soon covered in splodges of paint and was illegible. The media came at 3pm, when there were very few people (in Darwin no-one ever gets anywhere on time) and were told to come back at 4pm. By then about 50 people had turned up, which was close to the number who said they were attending on Facebook, which seemed to be the main conduit for information. The media didn’t reappear. The first speaker was Kerry, who seemed to be the convenor of the protest. She acknowledged the Larrakia people, on whose land we were on, and gave a brief overview of the Occupy Wall Street protest and the designated day of action in solidarity occurring all over the country and world. Next up was Strider, a long-time Darwin activist who added more to Kerry’s speech about the day, and bought his own take on the notion of capitalism and the global economy to the applauding crowd. The final speaker was Jono, who brought a distinctively local take on the unhealthy link between government and corporations. He talked about the proposed gazetting of an area of Litchfield National Park for the creation of a high-class tourist resort that would be off limits to all but those who could afford to pay the exorbitant accommodation costs. In effect, privatising a section of Darwin’s closest national park. It’s well used by locals and tourists alike, and is a favourite place to cool down and relax. A photo op was next on the agenda. Everyone was roused to hold placards and make plenty of noise. Shots were wanted to share with others all over the world protesting the wrongs of global capitalism and the inequity of making the working and non-working people pay for the mistakes and profligacy of the rich. Open mic followed, which was when a LaRouchite, who’d been standing alone with a sandwich board depicting either the queen or Julia Gillard in royal robes and the phrase ‘I want to carbon tax you’ scrawled beneath, grabbed the mic. Her first bit of advice was to ‘ditch the witch’, which may have got her applause at a Tony Abbott-endorsed rally but got nothing from anyone in the Occupy crowd. This was followed by a brief analysis of the failings of the OWS movement: that there was no leader (which I think is its strength). She assured those leaderless minions present that the LaRouche senators in North America were working on this, and the travesty of a leaderless movement would soon be rectified, which I’m sure is news to all those currently occupying Wall Street. She flipped the page of her sandwich board to reveal Barack Obama’s face with a Hitler moustache. She proceeded to list Obama’s crimes, one of which was that he’s actually a British agent. Her solution? To have Obama declared criminally insane and removed from the White House. 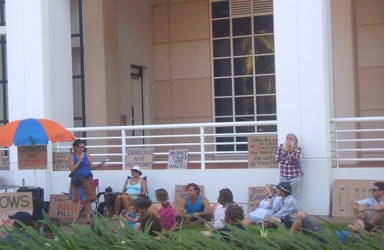 By this time it was apparent that Occupy Darwin had morphed into a lecture in Political Insanity 101. Ten minutes later, she flipped the page to some picture of a tax model and was talking about the Eurasian land-bridge and arcane bits of North American constitutional theory. Her sandwich board book looked like it had a few more pages to go and with every page getting at least a fifteen-minute explanation, it looked like she’d be rambling incoherent paranoid nonsense for the next hour. I decided to go at this point as I couldn’t bear listening to her any longer. I don’t know if she ever finished or anyone else got to speak, but I’m sure she killed any desire anyone had to occupy the lawn in front of the palace of excess and lies that is Parliament House, that night or the next day. So no revolution occurred in Darwin, but I’m sure no-one expected one. It was great to catch up with people, and meet new people in the milieu of alternative, leftish politics here. It was heartening to add our voice to the chorus of enough is enough it’s time for a change that is echoing around the world. It feels revolutionary to see the anti-capital, anti-corporate movement (often known as anti-globalisation – a misnomer which simplifies and reduces the movement’s ideological drive) that came to the fore after the fall of communism and once seemed to be lighting the way for profound change has been reignited. To me the OWS movement is similar if not the same as the anti-WEF protest in Melbourne in 2000 (unfortunately known as S11), Battle in Seattle (1999), the Genoa Group of Eight Summit protest (2001), and others at that time that created a real sense of hope in radical social change. That moment of light in the tunnel was extinguished when those planes flew into the twin towers, and suddenly protest equalled terrorism. Draconian laws were introduced and the nascent movement lost its impetus in a climate of fear. For that moment though, when the bogeyman of communism ceased to have any meaning and no new bogeyman had been invented, hope sprang eternal. Now, with the glaringly obvious evidence that the thing that’s making ordinary people’s lives hard is not Islam, not Communism, but rather global corporations, overpaid executives, amoral share traders, and the reality that modern government only exists to facilitate corporate functionality, people are again demanding real change. ‘Well Done Humans’ is the most beautiful sign I’ve seen yet. Thanks for this post, Rohan, it’s great to keep in touch with what’s going on around the country. Indeed, thanks Rohan. I guess I must be pretty naive (and I admit, I’ve never been there), but I imagined there’d be a much bigger Occupy scene in Darwin, mostly because of the Intervention, but also Indigenous incarceration rates, crap politicians and so on. Maybe I’ve just been looking at too many of the radical feminist papers from the 70s and early 80s, a number of which, like Rogue, came out of Darwin. Do you think this protest is an accurate reflection of the state of the Left there? Thanks Clare, I’ve also enjoyed reading posts from other cities. Jack, unfortunatly I think the protest is a reflection of the active left in Darwin. It’s not a big scene as such. I think there’s times when it has been bigger, when Jabiluka was an issue for example the scene was a lot bigger, by all accounts. This is, in part Darwin thing, in that the Darwin population is very transit so there may be years when there’s a bigger left scene and years when it’s smaller. There are a lot of issues here, as you mentioned. A lot of the left will go to marches against the intervention, for example, but you’ll see bigger marches down south against the intervention than you see up here. Like much of the left in Australia the struggle is to engage indigeous in a broader left stuggle but the left is seen as another whitey project so indigenous people don’t seem really keen on joining, so to speak. 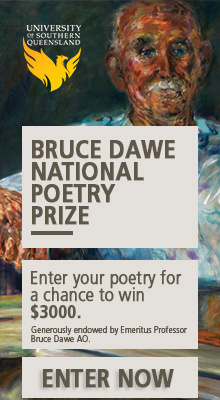 Things like Muckaty may help rectify this, as Jabiluka did to some degree (although mistakes were made there). There seems to be two Larouchites, and two sellers of Green Left Weekly in Darwin! The LaRouchite’s have a weekly stall at Parap market. You should come to Darwin sometime, it’s a unique Australian city. But I mean aside from that it sounds good! 50 people is a massive turnout for Darwin, i reckon. Are you sure you can count? 50 people including kids and dogs Will, I may not teach maths but I can count! agreed on the left and Aboriginal people. Eldoon, I know who you are in real life, and what can i say, whinging about the heat, obviously you’re not a ‘true territorian’ as for wanting to have the protest somewhere else, maybe you could come to the next meeting and propose an alternitive venue, if you can get your mouth off your bong long enough to do that! Factually incorrect. Charles Darwin National Park is within 5km of Darwins Parliament house. Litchfield is at least an hour and half drive. forgot about CD National Park, it’s so small it’s hard to think of it as a national park. It’s not a place people flock to. Please have Rohan contact me when able.